Want a copy of each and every status update you’ve ever posted to Facebook, along with all your photo albums, videos, chats, and even comments? All you have to do is ask. Facebook has a “Download Your Information” feature that will pack all your shared content into a digital trunk of data, which you can then download to your desktop. The file includes pretty much everything you’ve ever shared on Facebook—we’re talking wall posts, comments on your wall posts, photos, video clips, Facebook messages, chat transcripts, and the names of your friends. Facebook has also announced that starting soon, the information packed into your digital Facebook archive will include any previous names you’ve used on Facebook, all your prior friend requests, and even the IP addresses of every computer, smartphone or tablet you’ve ever used to log into your Facebook account. 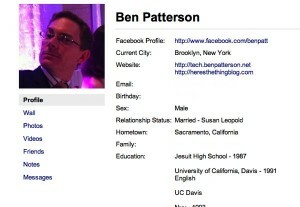 So, what isn’t in your Facebook archive? The personal information of your Facebook friends (except for those who allow their email addresses to be shared), as well as their own posts and photos. Also not included in the archive: comments you’ve made on other people’s posts. From any Facebook page, click the little down-arrow in the top-right corner and select “Account Settings” from the drop-down menu. Next, find and click the “Download a copy of your Facebook data” link at the bottom of the “General Account Settings” page. 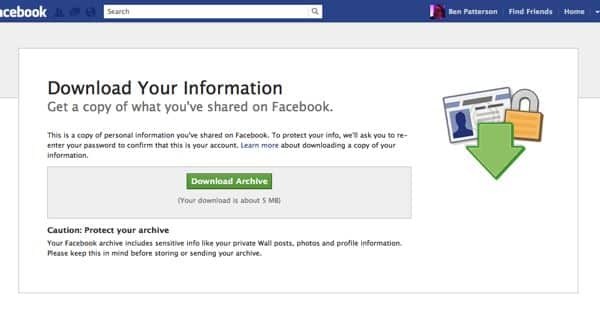 You should land on a page that describes all the information your download will include, along with a warning to think twice before sharing your Facebook archive with just anyone. Ready to proceed? Then click the green “Download” button. Once you’ve downloaded your Facebook archive, you’ll be able to view your profile, photos and videos from your hard drive. Once your archive is finally ready, Facebook will send you an email. Click the link in the message, and you’ll arrive at a Facebook page where you’ll be asked to re-enter your password. All set? Then go ahead and click the green “Download Archive” button to download the file (which should be labeled with your Facebook user name) to your system. Remember to note the location of the file on your hard drive; to make locating the archive easier, you might want to download it straight to your desktop. Open the archive folder, then double-click the file named “index.html.” Your web browser will open, and you’ll see a bare-bones page with your Facebook profile, complete with links to your wall posts, photos, videos, friends, and Facebook messages. Keep in mind that these pages aren’t living on the Internet; instead, they’re sitting “locally” on your computer’s hard drive, and only you can see them (well, unless you share them with someone else, that is). To find your actual photo and videos files, just open the “photos” and “videos” folders in your downloaded Facebook archive, and voilà—there they are, ready to be clicked and dragged anywhere on your hard drive. Now that you’ve downloaded an archive of your Facebook info, what if you want to wipe all your data, photos, and videos off Facebook? To do so, you’ll need to delete (and not just deactivate) your Facebook account. Here’s how.